October | 2013 | Mike Lamberti, From Margate To Cleveland, And Back ! In the annals of New Jersey high school athletics, few sports invoke the passion that wrestling does. With that said, Princeton University has an event on its docket which will surely bring the proverbial house down on Saturday, Dec. 14. On that day, Princeton Tigers wrestling will make a long-awaited return to legendary Jadwin Gym when it welcomes Rutgers University for a match that will also celebrate the greatness that is New Jersey high school wrestling. According to Princeton head wrestling coach Chris Ayres, the festivities surrounding the match of two historic NCAA schools, will be a sight to behold. According to Ayres and assistant coach Joe Dubuque, every living NJSIAA wrestling champion will be invited, and honored, at the event. The first New Jersey state champions in high school wrestling were crowned back in 1934, meaning a wrestler from that era could very well be a World War II vet and is in his late 80s. In 1934, there were nine champions, with five hailing from Newton High School, ironically Ayres’ alma mater. The weight classes back then started at 95 pounds and extended through the heavyweight bracket. 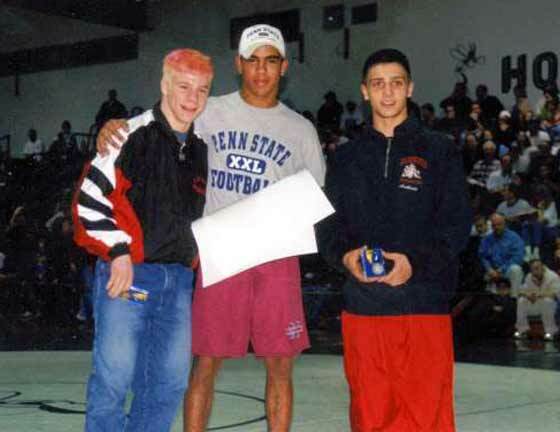 Dubuque was a two-time NJSIAA champion (2000 and 2001) while wrestling at Glen Ridge High School. He would follow his high school career with an even more impressive collegiate performance, including back-to-back NCAA titles at the University of Indiana in 2005 and 2006. The match will start at 5 p.m. For those fans who enjoy the history of college athletics, Princeton and Rutgers played in the first-ever football game in 1869, and while the two schools share the same state and are relatively close, geographically, the schools don’t meet often in intercollegiate athletics. 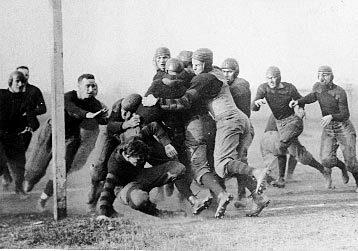 It is widely recognized that Rutgers and Princeton played the first college football game in 1869. The coaches at Princeton are also extending invitations to current New Jersey high school wrestling teams to be a part of the night on Dec. 14. For more information, contact Dubuque at Princeton, by E-mail (jdubuque@princeton.edu) or call 609-258-5248. Happy 15th anniversary to the new life of Mike DiPiano, Sr.
Fifteen years ago, Michael DiPiano was preparing to die. With his health deteriorating because of diabetes, the Nutley. NJ native was on dialysis for kidney failure and had been read his Last Rites. He was a devoted husband and father of three, a well-known wrestling coach and athletic director in New Jersey. His life, while so fulfilling, was seemingly coming to an end, at the age of 47. On Oct. 25, 1998, Mike’s life was re-invented with the gift of a double organ donation. And today, things couldn’t be better for the man most of us know as ‘Big Dip’ and whose heart and vitalized spirit has helped thousands with his ‘Gift of Life’ message and the significance of organ donation. Now living the dream in Daytona Beach, Fla., with his wife, Karen, Mike has spent countless hours with children who also have received organ donations. Every Christmas season, he hosts a party at St. Barnabas Medical Center in Livingston for those children. 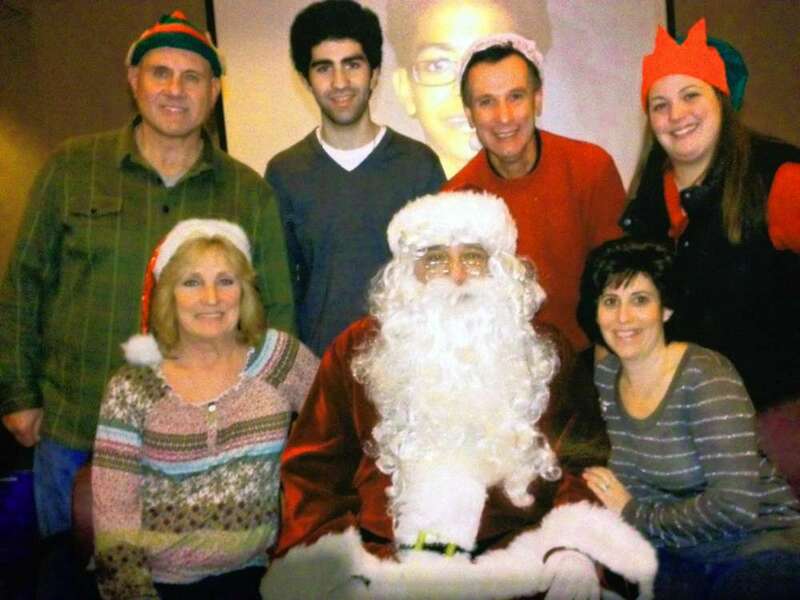 Mike DiPiano plays Santa with his Elves at a Christmas Party at St. Barnabas Medical Center in Livingston. The organs that saved Mike’s life were donated by a man we’ll know simply as Sean, a 21-year-old who, on Oct. 24, 1998, was killed in an automobile accident. 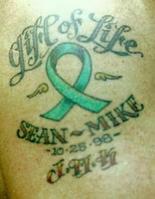 Sean had indicated on his driver’s license that he wanted to be an organ donor in the event of his death. Mike recalled the months and years leading up to what is now his 15th anniversary of good health. At that time, Dr. Leon Smith stepped in, through a contact of Fr. Leahy’s. A renowned Internist who specializes in infectious diseases, he assessed DiPiano’s condition. "If it weren't for Dr. Smith and the Grace of God, we would have lost him a long time ago," Fr. Leahy said. "He went from a 5 percent chance of survival to the poster child for organ transplant. It's a great overall story." DiPiano's association with St. Benedict’s Preparatory School in Newark is legendary. As the wrestling coach there, he amassed a record of 274-89 and was named the Coach of the Year by the Newark Star-Ledger in 1987. He is a member of the St. Benedict’s Hall of Fame, as well as the USA Wrestling Hall of Fame in Stillwater, Oklahoma. After coaching at St. Benedict’s, DiPiano became the school’s athletic director. In May, 2012, he received the school’s highest honor to a Lay person, the Medal of St. Benedict’s. Mike’s family, his wife, Karen, daughter Michelle and sons Michael Jr. and Frank had never given up on the rock of their family beating any kind of odds. On the surface, DiPiano is a hard-nosed individual, a man’s-man who takes no prisoners, so to speak. But he has no problems expressing his emotions on this subject. He recalls attending the first Transplant Games, for those athletes who are recipients of organ donation, in Minnesota some nine years ago. DiPiano’s message has resonated well in Nutley and other communities in New Jersey. The Gift of Life Duals, a series of wrestling matches to bring awareness to organ donation, will have its third renewal this coming January. The first two events, at Nutley High, where Frank DiPiano is the head wrestling coach, were a huge success in Jan. 2012 and 2013. The 2014 version will be held at Demarest High, where Mike DiPiano, Jr., is the head coach. And Mike Sr. will be there to deliver the message. While he lives in Florida, he’ll be ‘home’ for the holidays, to host the Christmas party in mid December, enjoy some quality time with his family and then devote time to the Gift of Life Duals, where the slogan ‘Organ Donation Is A Major Decision‘ will once again resonate. With October being National Breast Cancer Awareness Month, many high school athletic teams, as well as college and professionals, have been honoring those who have fought the courageous fight against the wretched disease. At Nutley High School, members of the very successful girls’ soccer team will play Park Ridge on Oct. 21 in an independent game. The Raiders will wear pink socks and raise funds for Gail’s Angels, a non-profit (501c)(3) organization dedicated to providing support to families that have a mom with breast cancer and also care for their autistic or special needs child. (For more information, check out their website at http://www.gailsangels.org). 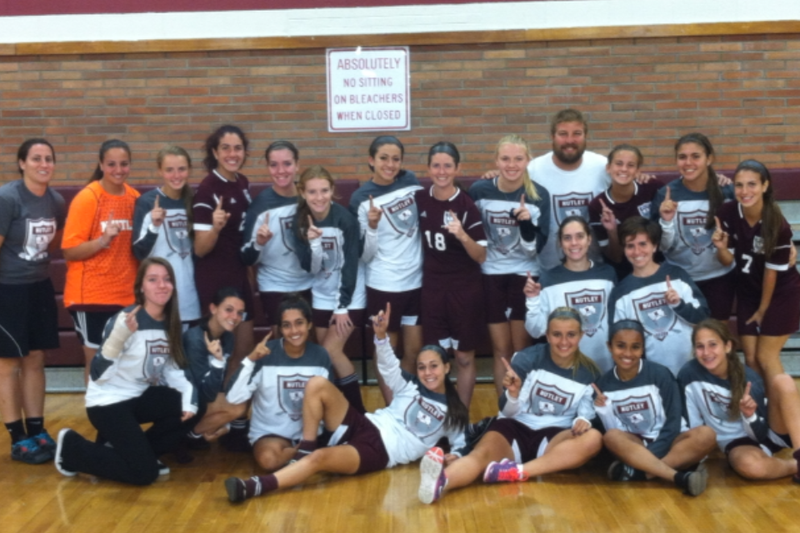 Members of the 2013 Nutley High girls’ soccer team. On the field, Nutley took a 10-1-1 record into its game with Park Ridge. The Raiders were ranked among the state’s top 20 teams heading into this week and advanced to the Essex County Tournament semifinal round before falling to Livingston, 3-0, last Saturday evening. The Raiders should garner a high seed in the upcoming NJSIAA Tournament. 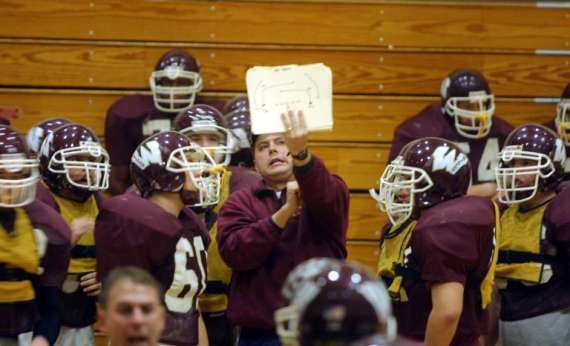 A tradition begun by his predecessor continues on at Wayne Hills for new head football coach Wayne Demikoff. Each week, the coach meets with parents in a classroom at the high school to review film of the previous week’s game. The meeting is generally held on Wednesday nights and is attended by parents, usually a male, but the moms, and females in general, are also more than welcome. Long time Wayne Hills football coach Chris Olsen began that tradition when he first arrived at Hills in 1987. In fact, according to Pat Cosgrove, one of Olsen’s longest-tenured assistant coaches, Olsen did the same thing at previous coaching stops at Paterson East Side and Bergenfield. At the most recent film review, Demikoff broke down just about every play to the parents on hand, detailing blocking schemes, good recognitions by the players, missed assignments and the steady improvement he’s seen from the Patriots through the first five weeks of the season. Wayne Hills football coach Wayne Demikoff gives instruction to his players, but also loves to discuss film of his team’s games with parents. While Demikoff can be stern with his players in practice to keep the intensity level high, he’s practically giddy when discussing the film with the adults, showing them how much their sons have improved since the summer. Demikoff also emphasized the importance of the Oct. 18 home game against nemesis Pascack Valley. Next week, when he reviews the film of the Pascack Valley game with the parents, we’ll see where the Patriots stand after six weeks of the 2013 season. For four years, she dominated in the circle at Livingston High, pitching to a higher level than what was ever seen before in Lancer-land. Jess Peslak completed her high school softball career last spring with some astounding numbers. Among her accolades were leading Livingston to back-to-back Super Essex Conference, Essex County Tournament and North Jersey, Section 1, Group 4 crowns in 2012 and 2013. 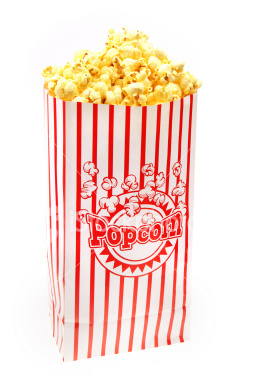 I often wrote ‘Get Your Popcorn Ready’ anytime Jess would pitch in a big game. Well, now that she’s a freshman at Hofstra University and pitching there, it’s time for a new era for one of my favorite all-time high school athletes. So far, so good, said Peslak in discussing the transition to college. 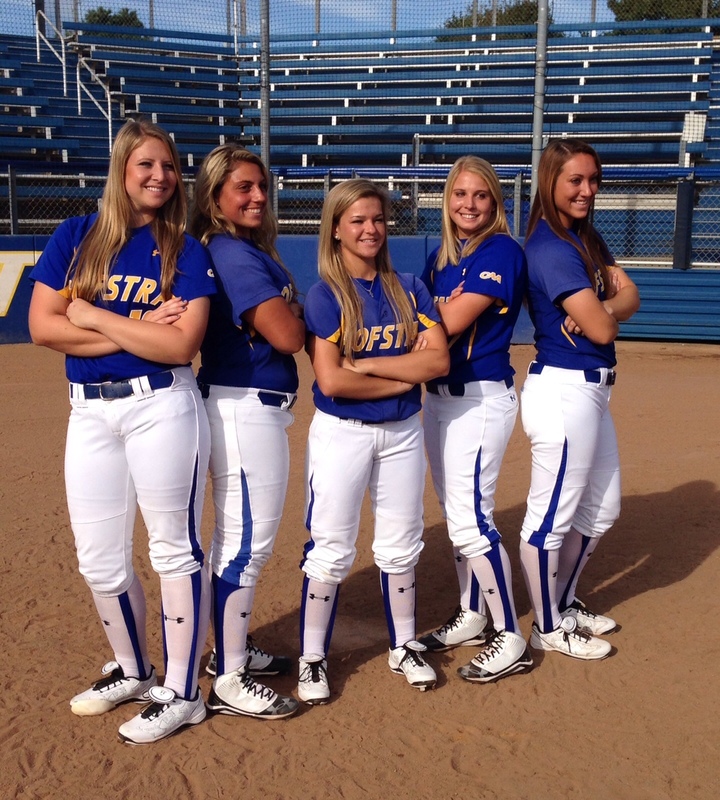 Former Livingston pitcher Jess Peslak (far left) with some of her new teammates at Hofstra University. Peslak pitched in a fall game at Branch Brook Park on Oct. 6 and was the winning pitcher, in relief, as Hofstra rallied to defeat Temple. It was interesting to see Peslak pitching to Temple’s Sarah Prezioso. The last time they faced each other was late in the 2010 high school season when Prezioso, a senior at Bloomfield and one of the state’s dominant hitters that year, hit against Peslak, then a freshman at Livingston. Peslak recorded a pair of strikeouts and had a no-hitter in that game until Prezioso led off the seventh inning with a bunt single. Afterward, Prezioso sought Peslak out to say congratulations on a tremendous game, which the Lancers eventually won, 2-0. Prezioso fouled off a number of pitches on a 2-2 count before flying out to deep center. Hopefully, the two will meet again during the spring season. In the meantime, it was good to hear from Secretariat, as she gets settled into the college scene. Not so surprisingly, she’s doing well in the classroom, too. And if she’s becoming an even better pitcher than we saw from 2010-2013, there will be plenty to talk about in the years to come. While the Wayne Hills football team prepares for a huge game on Oct. 18 against Pascack Valley at home, the team, as well as the entire Wayne Hills community, has a heavy heart after the passing of Dana Smith. Mrs. Smith, the wife of Wayne Hills’ site coordinator, Brad Smith, lost a difficult battle with breast cancer at the age of 41. She was a wife and mother of two small children, Anthony and Taylor. According to Wayne Hills assistant football coach Jon Goldstein, Brad and Dana were high school sweethearts while attending Wayne Hills (both were graduated in 1990). 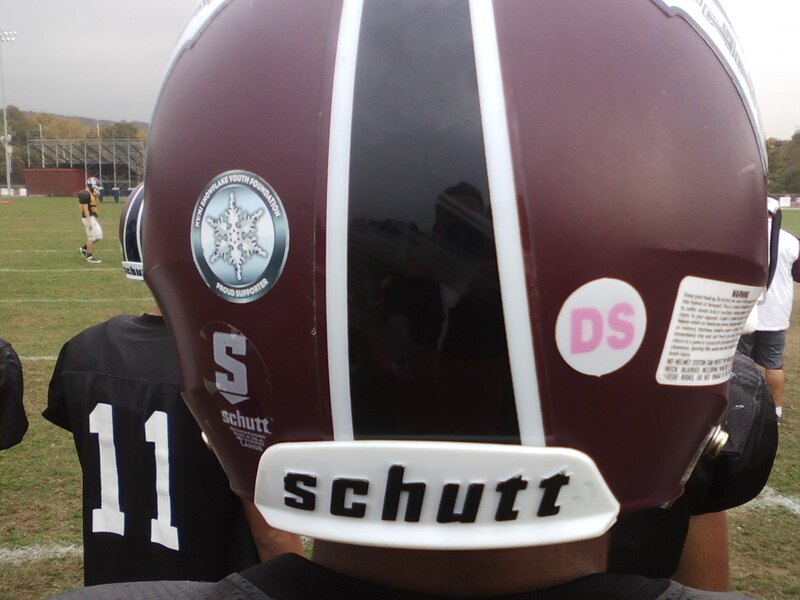 Wayne Hills football players will wear a ‘DS’ decal (far right, as seen on Brian Burges’ helmet) in honor of the late Dana Smith. 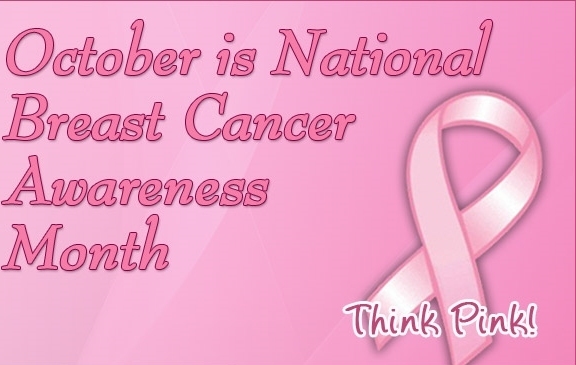 October is ‘National Breast Cancer Awareness Month’, so all the athletes at Hills have been wearing pink to honor those who have fought the good fight against breast cancer. Now, with the passing of Mrs. Smith, that battle has attained a new level of awareness at Wayne Hills. Hurricane Sandy devastated so much in the Metropolitan area nearly a year ago. Like so many communities in New Jersey, Wayne was hard hit. Over the past 12 months, a somewhat sense of normalcy has returned, although those who live on, or near the Jersey Shore will say there’s still much to do before their homes and businesses are restored to pre-Oct. 28, 2012. With healing comes symbolism, and at Wayne Hills High, the return of one of the school’s eight championship football banners provides a small (in retrospect) but nice addition to the fence behind the end zone where, once again, eight banners reside. 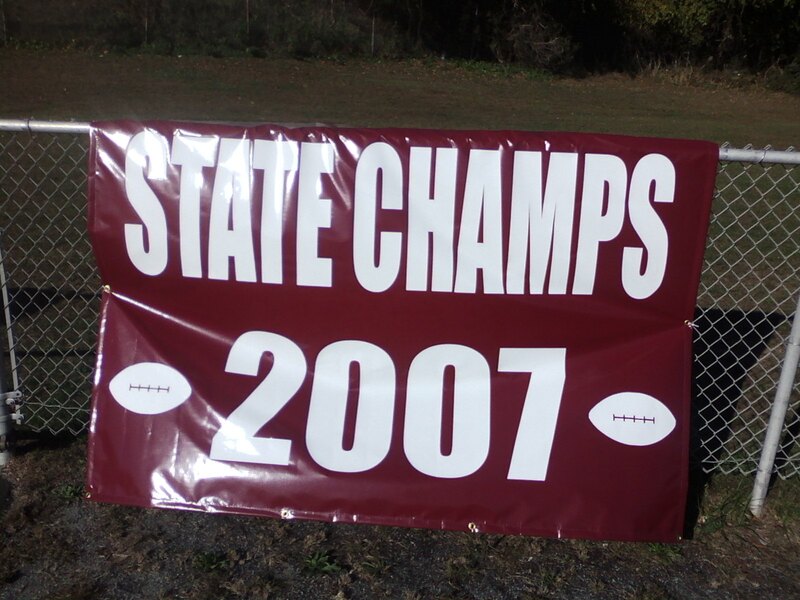 According to assistant football coach and long-time Wayne Hills guru, Jon Goldstein, the 2007 championship banner was destroyed by the storm, while the 2002, 2004, 2005, 2006, 2008, 2010 and 2011 banners endured. Last week, the 2007 banner was finally put back up on the fence. 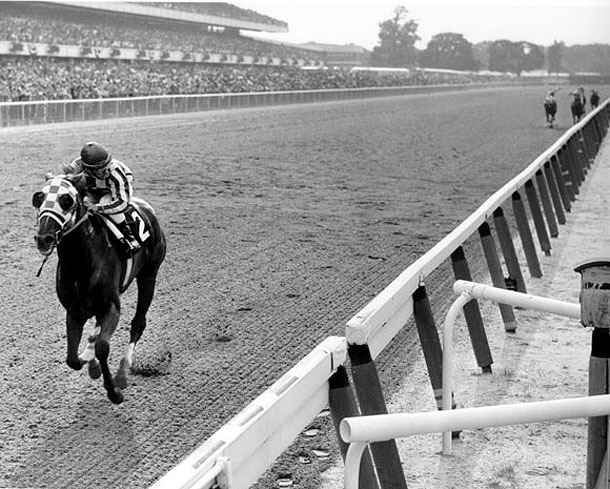 “We’ve always been about tradition here,” Goldstein often says. “It can be anything from the coaches gatherings on Thursday nights before our next football game to pride in winning a championship, in any sport at Hills. Steve Pusterla, a senior and team captain for the 2013 Patriots, saw the ’07 banner back in its familiar perch and smiled.